Hydrangeas make a beautiful addition to the yard or garden, adding a rainbow of colors, including pastel pink, pale blue, deep purple, lavender and multi-colored petals. The plant blooms throughout the spring and into late summer and early fall, producing clusters of showy blooms. Once the blooming season is over and flowers fade and die, the process known as “deadheading” takes place to remove the dried cluster heads. Removing the dead heads not only enhances the look of the plant, if removed early enough, the dried flowers are usable in craft projects. 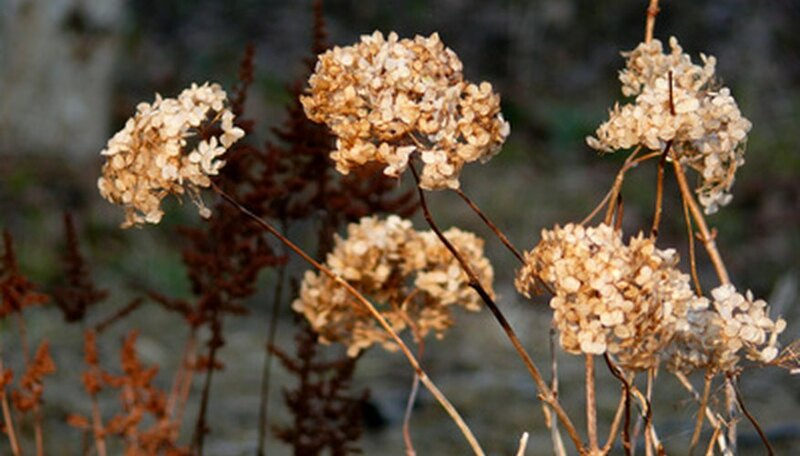 Clip the dead hydrangea blooms, along with a portion of the stem, using the garden clippers during the fall months of October through early November or after the blooming season has ended, and flower heads have turned brown. Place the clippers along the length of each stem just above newly formed buds. Hydrangeas begin to form buds early. Clip the stem cleanly, being careful not to damage any new growth. Place dead blooms and stems in a container for later disposal, or use the dried hydrangea blooms in dried flower arrangements or potpourri mixtures. Trim the stem and deadhead the blooms to stimulate growth, resulting in a fuller plant and more blooms during the season. Ferguson began freelancing in 1998 and hasn't put the pen down since. Her editorial stints have included working as a reviewer, managing editor and senior managing editor. She writes for several websites and covers a range of topics, including travel guides, gardening, home decor, crafts, pets and wildlife. Ferguson specializes in flower craft articles and has worked in the flower craft business for some time.